James Heal, a manufacturer of textile testing machinery, based in Halifax, West Yorkshire, have invested in a new high-precision CNC Lathe to improve and grow their Machine Shop capabilities. 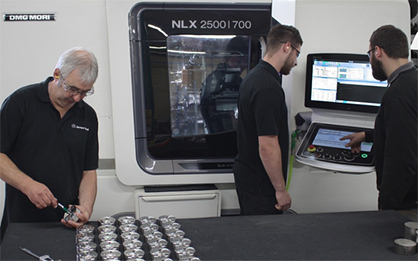 The DMG Mori NLX2500SY/700 is billed as a machine that ‘achieves powerful turning capabilities and outstanding milling performance’, enabling operators’ to perform machining of various workpieces, from simple- to complex-shaped components with an easy operation. Components which would previously have been made on two separate machines, can now be completed on one, positively impacting cycle and set up times by significantly reducing the hours involved. James Heal pride themselves in manufacturing instruments from component level up, and the new Lathe will be used with particular focus on their flagship instrument the Martindale, an abrasion and pilling tester, primarily used to test textiles. This investment is an important factor in the growth of the company, increasing the capacity and flexibility of its manufacturing arm. The already high quality of their manufactured components will be improved upon, underpinning James Heals position as leaders in the testing marketing. It also promises exciting developments for customers, as designs can now incorporate more complex components, all of which will be made in house. Amanda McLaren, James Heal Managing Director said ‘this investment is another indicator of James Heal’s long term commitment to all of its stakeholders, as we continue to move forward with our ambitious growth programme. We consistently set the standard in our field of Textile Testing and this investment allows us to further develop our machinery designs, in order to support the requirements of the end user. This investment in this DMG-Mori Model was wholly backed by our owners, Battery Ventures, based in Boston, who provide an ongoing level of financial commitment to our Business, which under-pins our growth plans for the years ahead.